~Walk The Line Band~ enters the stage , performing songs of "The Man In Black" that bring back those special memories of the past. ~Walk The Line Band~ plays a show that can't be missed and won't soon be forgotten. Over 2- 1/2 hours of Johnny's songs are pulled out, from his early years to his latest and final recordings. Rock a billy, dancin' tunes, ballads and good old country rock and roll are portrayed just like the old "Tennessee Three" did years before. 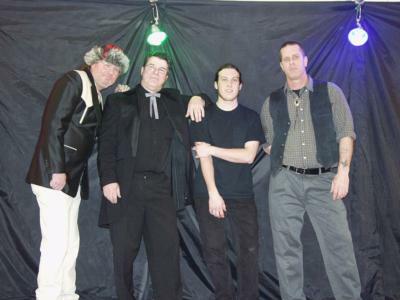 ~Walk The Line Band~ is dedicated in displaying professionalism and showmanship, they are a fantastic band for Johnny Cash and country music fans alike. 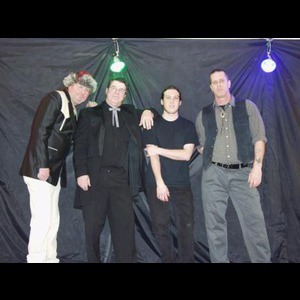 The band performs shows in and around the New England area. We were very satisfied with their performance. A number of the audience members that I talked to said the performance was outstanding, and everyone really enjoyed hearing so many of the Johnny Cash songs they remembered. It is a bit difficult to evaluate the performance on short notice, without a much feedback from the audience overall, so these responses are somewhat based on my personal view and anecdotal comments from some attendees. I believe that the general audience (nursing home residents and their family members for the most part) enjoyed the performance. It was energetic and entertaining. It went a little longer than their expectations (they tend to get tired and anticipate a certain timeframe. We had to move it indoors, where the acoustics are different than the intended venue, and the sound quality/resolution suffered. All in all, I'll say we enjoyed it a lot. Please note ~Walk The Line Band~ will also travel to Fairhaven, Acushnet, North Dartmouth, South Dartmouth, Mattapoisett, East Freetown, Rochester, Raynham Center, Westport, Marion, Fall River, Assonet, West Wareham, Chartley, Lakeville, North Dighton, Somerset, Tiverton, Wareham, Berkley, North Attleboro, Cuttyhunk, Dighton, East Taunton, Little Compton, Middleboro, Swansea, East Wareham, North Falmouth, Pocasset.